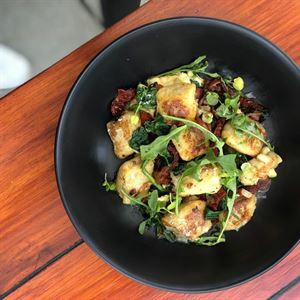 After a morning spent in the turquoise waters of Burleigh Heads beach, dust the sand from your feet and head to Be Somewhere cafe to satisfy your hunger. Opt to sit alfresco and lap up the morning sun in the alleyway or head through the heavy barn style doors and into a bohemian chic dining space styled with a mix of wooden furniture, polished concrete floors and window bay bar stools, creating a relaxed space to meet friends. Keeping in tune with the health conscious locale, Be Somewhere has created a menu with a focus on nutritional meals which can be adapted to suit tastes and dietary requirements. Tuck into the Nourishing Bowl – with greens, quinoa tabbouleh, avo, roasted sweet potato, feta, dukkah and local, hot smoked salmon, washed down with an easy green cold pressed juice.